Sunday 18th May was our first public showing of 509. The flying crew for the day were Phil, Neil, Bradley and myself. Jo, Nina, Becky and Tony (Becky's husband) were to go ahead of us to Lytham Hall to greet the vehicle owners we had invited along. We flew from Blackpool Airport down the coast past the windmill on Lytham Green and then inland to Lytham Hall. All the way down the coast we could see everybody below craning their necks to look up at us as we cruised along. It is an amazing feeling sat in the door gunners well looking down on the beach, the fields and the trees below especially during a banking turn. After a circuit to make sure Phil was happy with the wind and where he was going to land Phil readied for the final approach. As previously , 509 made a magnificent appearance as it came into view from around the trees. Outside the Hall were the truck owners we'd invited. Cameras at the ready , 509 then did her party trick and cleared the lawn of any grass cuttings. Great video footage was being filmed by all, until that is, the downwash caught them all unawares. Wobbly vision doesn't do justice to the pictures. First lesson of the day, all those photographs showing soldiers crouching, whilst the Hueys approached or departed, wasn't just to make themselve a smaller target but it was so to stop them being blown off their feet. 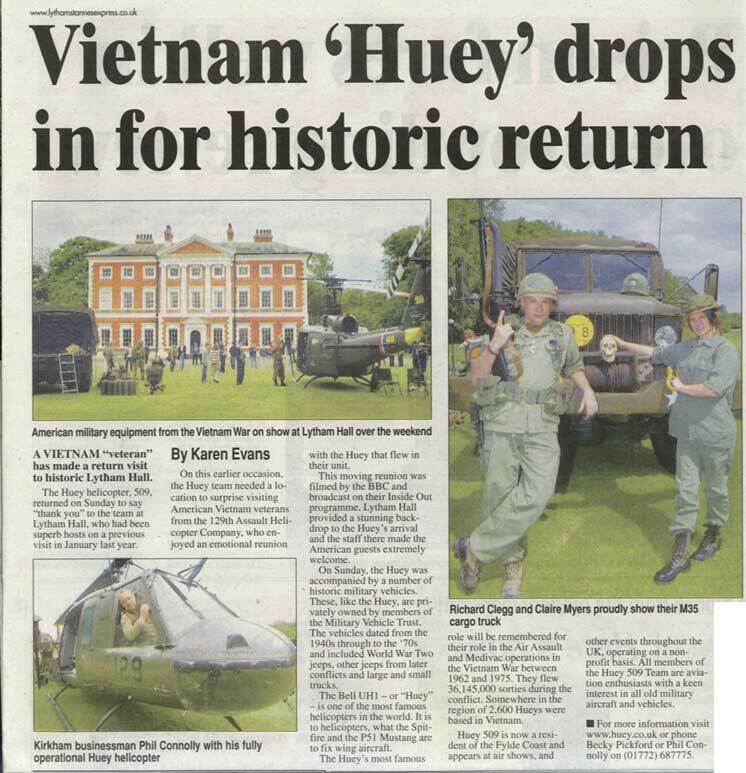 Down on the ground after just a ten minute flight the rotors were secured and the vehicle owners/vietnam re-enactors moved their vehicles closer and gathered round to at last see the helicopter they've all seen in the films and newsreels, but now for the first time come face to face with the real McCoy. All were, to a man, just amazed by her and the immense power. 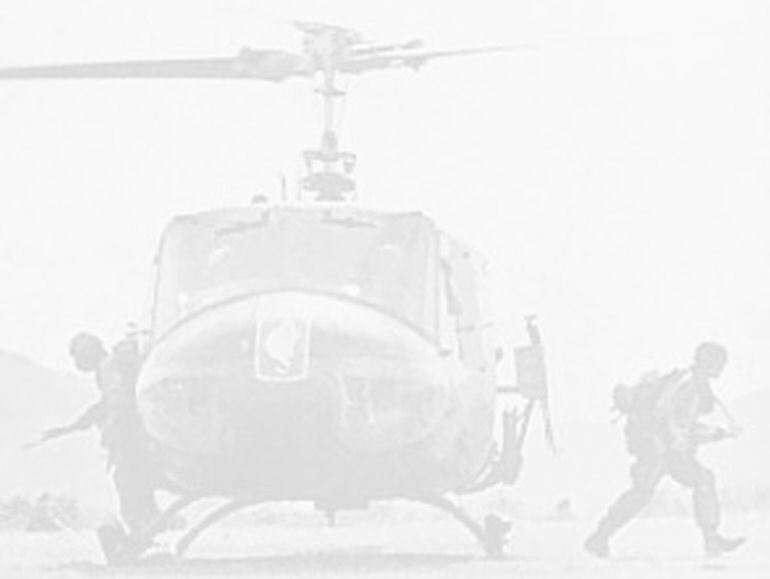 One guy said that it is one thing to read about the Huey, to see it in the films but to hear, feel and smell the helicopter is something else altogether. He has researched the Vietnam War for many many years but Sunday took that interest to a completely different level of understanding. He summed his feelings up by saying the Huey is just an awesome machine in so many ways. It's sheer size, much bigger than expected. It's awesome power and the sound, just so much more powerful than on film and it's sheer presence. 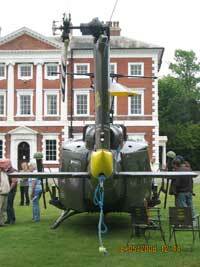 We were all at Lytham Hall for one of their regular open days to the public. After the help they gave us to surprise 129th veterans Ron, Fred and Mark last year, when we re-united them with 509, we said we would come along and hopefully attract a few more visitors to take a look at this historic house. Rather than just having 509 sat on the front lawn we felt it would make an interesting sight for the visitors with period vehicles and period uniforms on show. Lytham Hall looked magnificent in the warm May sunshine. The views to the east towards Preston and beyond as we flew in with the doors open were magnificent. We were very lucky as the day before had been overcast and dull, it just wouldn't have been the same. There was a constant flow of interested visitors throughout the afternoon. I lost count of the number of people I spoke to. At regular intervals we test fired the gas powered .50 calibre machine guns, always a crowd pleaser. We set up a large screen tv and throughout the afternoon we showed some of our 'home grown' videos about 509. No sooner had we arrived and five hours passed as quickly as anything. It was time for us to depart. 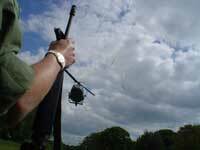 As Phil and Neil wound the Huey up I noticed that many watching us were either leant up against something for support or crouched down. Phil lifted 509 smoothly into the air, gently swung her around for us to fly away from the Hall. Once over the trees and over the golf course he turned her around with a loud clatter from the blades for a farewell flypast and for another photo opportunity. Once again a ten minute flight saw us back on the ramp at Blackpool Airport . She was soon put back in the hangar and secured. Within five days we would be reversing that and heading south to Beaulieu for the Trucks and Troops show. Don't forget to keep an eye on our events page to find out where we're going to be throughout the summer. For the article from Lytham Express, click here!